Which Salary Estimator Is the Best? Not like on a spiritual level way or anything. Like, how much you should be compensated for the work that you do. I am guessing many of you don’t. Hell… I don’t even know what I’m worth. Without knowing our worth, it becomes pretty hard for us to convince someone what they should pay us. For many, the make or break for accepting a position is salary. Where things get complicated is that salary is often (pretty much always) up for negotiation. In any case, you must know what your worth and be able to justify that from the beginning of the process. The negotiation itself becomes very difficult if you don’t have the right tools in your toolbox. The most widely used tool when it comes to salary negotiation is online salary estimators and salary comparisons. But, depending on which one you look at, you can get different answers. …We have dissected and analyzed the top 6 salary comparison to help in this process. Their estimator was super simple to use and navigate. 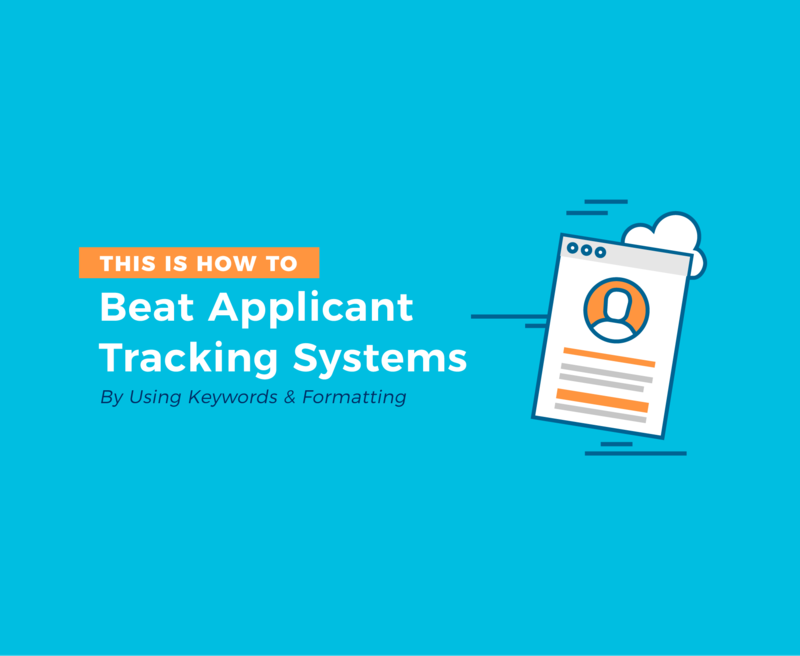 After entering the job title and location the data returns quickly and clearly. Like many other estimators, LinkedIn lays their salary data out in a histogram. This allows for you to easily see the range of salaries that they have collected. They also give you the option to dive deeper into your personal salary expectation. 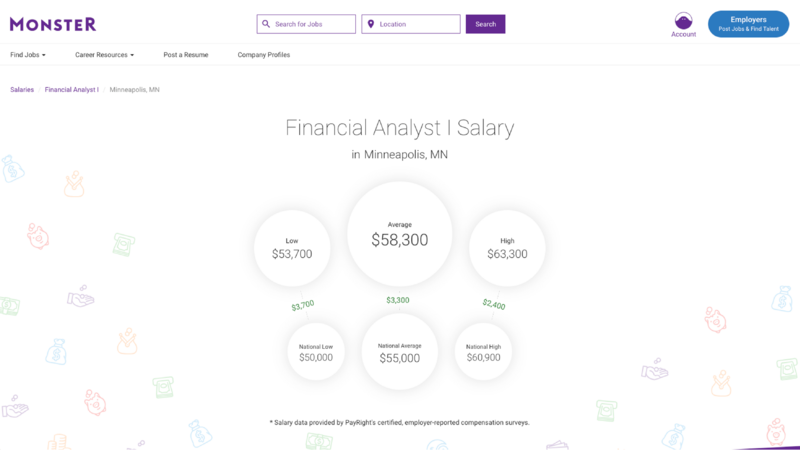 Filtering by industry and experience level, you are able to really hone in on what salary you should be prepared to discuss. LinkedIn also shares with you a sampling of pay at companies that have positions matching your searched title. This is where LinkedIn’s salary estimator didn’t perform as well as expected. When looking into Financial Analyst salaries with less than one year of experience, only 44 responses were returned. We expected a larger return population given the pervasiveness of LinkedIn. 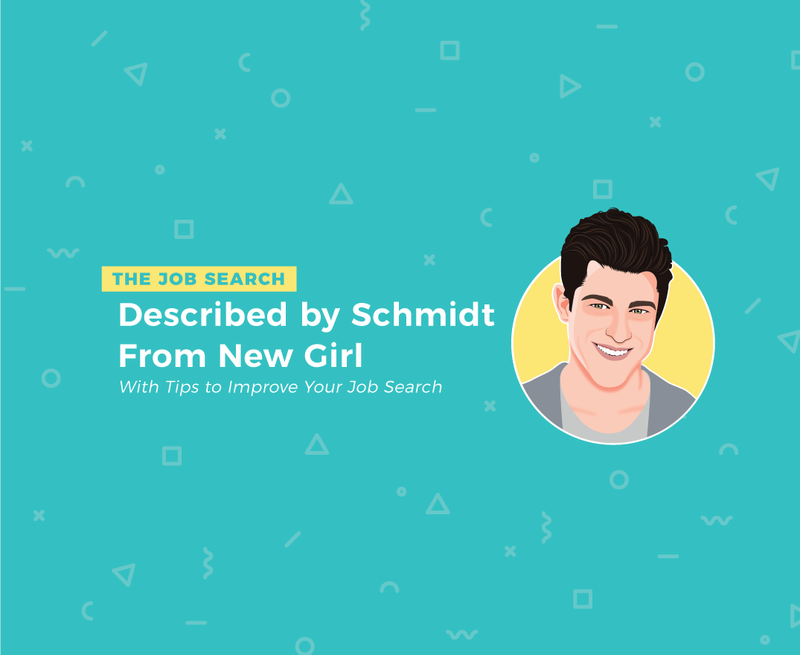 Given their brand popular we also expected a pretty good result from SimpyHired. THERE WASN’T EVEN A WAY TO FILTER BY PRIOR EXPERIENCE! Getting into another big name player in the space, we have Monster. Out of all the sites, this was a confusing one from the start. No description of what each one meant. We were looking to find a salary for an entry level Financial Analyst position so we took a shot in the dark and chose the first option. The result was a pop-up page with 6 numbers. They only gave a low, average, and high salary for that position. 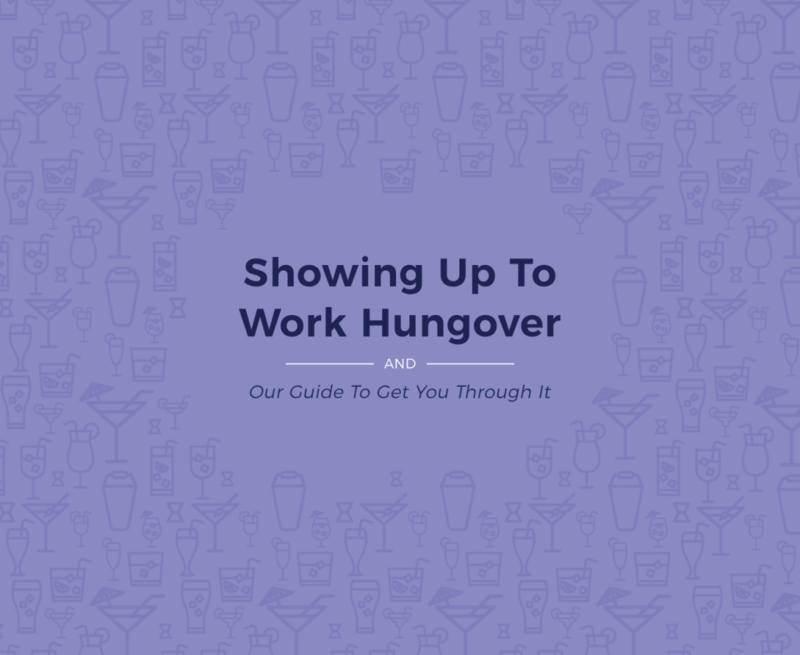 This allowed us to finally understand really what the “Financial Analyst I” really meant. …they didn’t have a salary for “Software Engineer”. We then went exploring and they didn’t have salary information for a few popular tech jobs either. This really tells us that Monster is not the place to go if you are in the hunt for a tech job. Up next, we analyzed another behemoth of a company, Glassdoor. Most recently, they added a “Know your Worth” section. 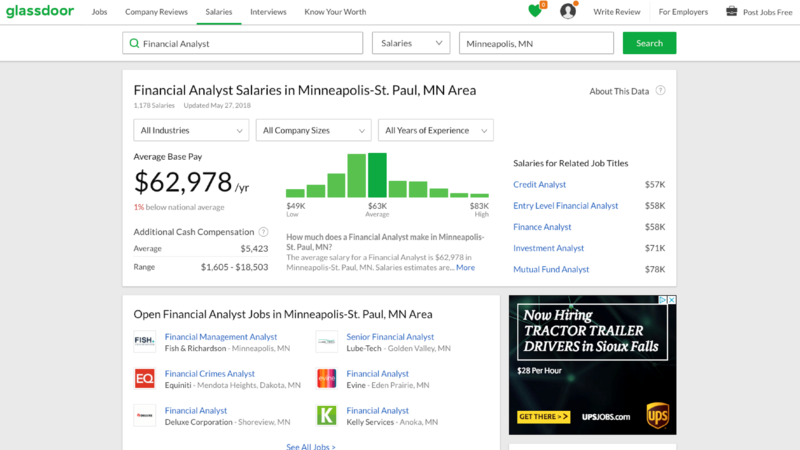 Out of all the sites that we are reviewing, Glassdoor is the newest to add a salary estimator. 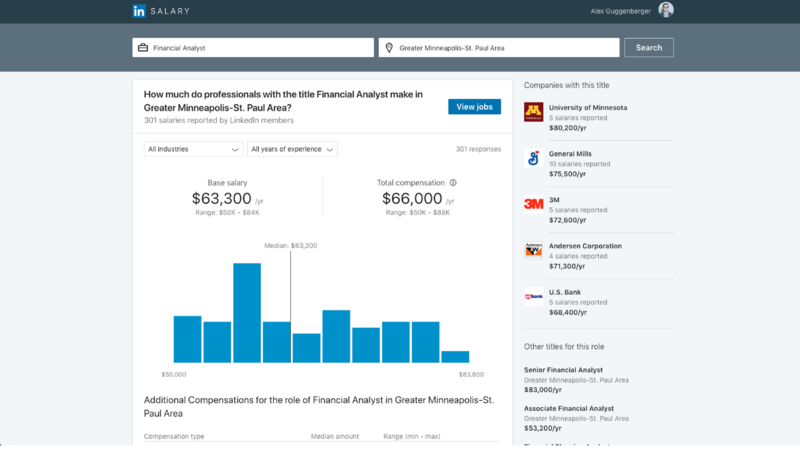 Similar to LinkedIn, Glassdoor allows you to filter by industry and experience level. More notably, they allow you to also filter by company size. So, if you already have the size of the company in mind, you can easily hone in on a more accurate comparison. They also have a very unique feature that no other site has. Let’s say you want to be a financial analyst, but the salary just doesn’t add up to what it needs to be. Glassdoor will help you explore ways to increase your pay. For example, achieve more education, certifications, or even learning a new language. 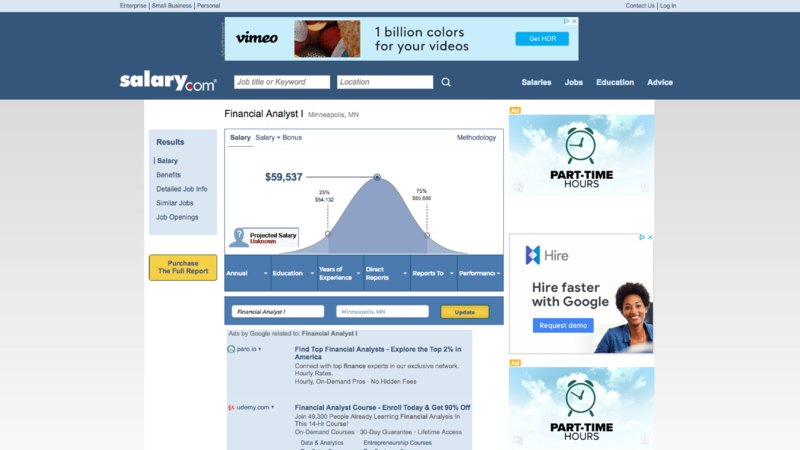 They tout their site as able to help you get that desired salary. 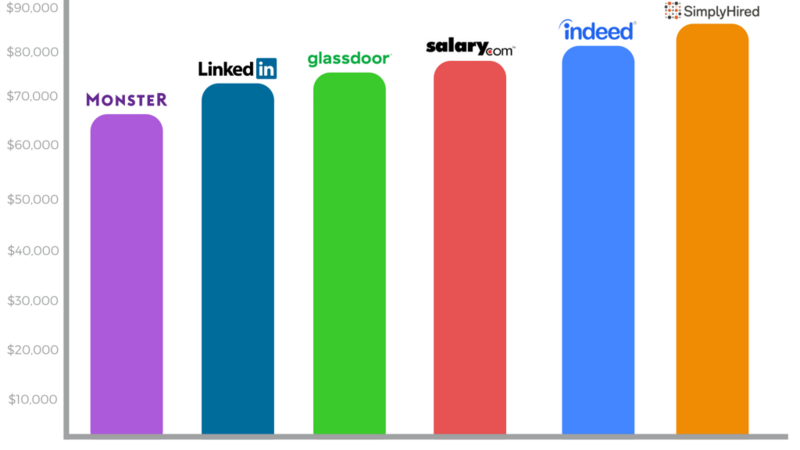 What Glassdoor does better than any other site out there is data. Compared to LinkedIn’s measly 44 responses for a Financial Analyst, Glassdoor had 1,178. Better yet, if you know the company that you want to work for, you can explore salaries that employees have submitted to Glassdoor. So, when you are looking at how accurate the response rate may be, Glassdoor definitely has the upper hand. 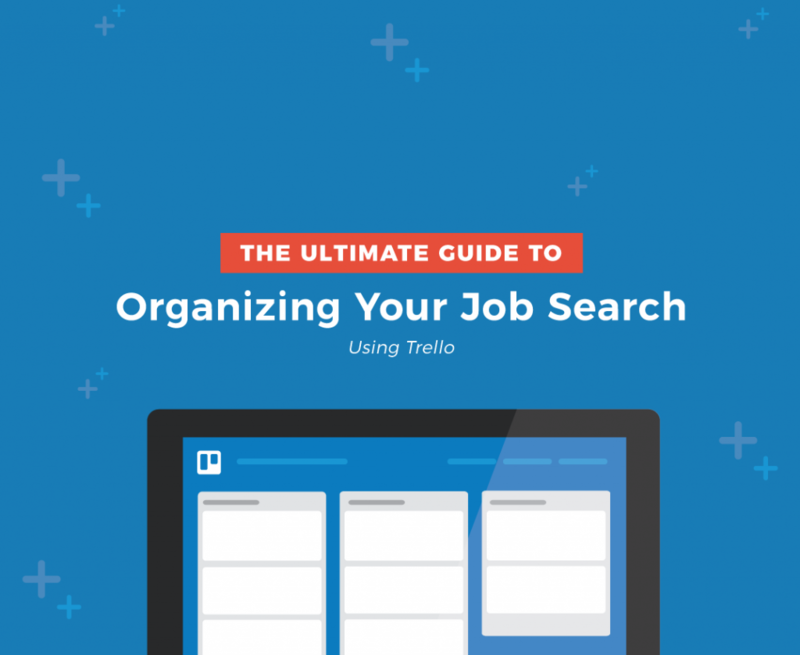 The most well-known job search site today, is Indeed. They also claim to be the worlds best job site. ^ but who really has the authority to say that? 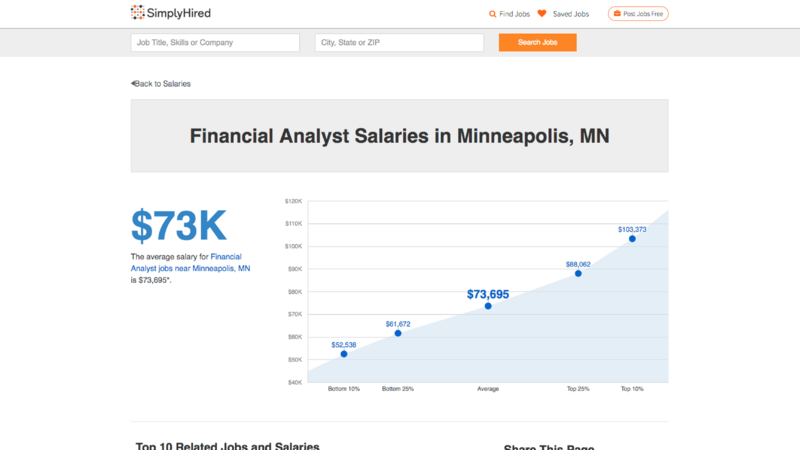 Indeed has a fairly simple salary estimator. Like many others, they display the data on a graph to show the distribution of salaries. They also show you salaries of local companies as well. ..there is no way to filter by prior experience. Just like Simply Hired, they both lack this much-needed functionality. 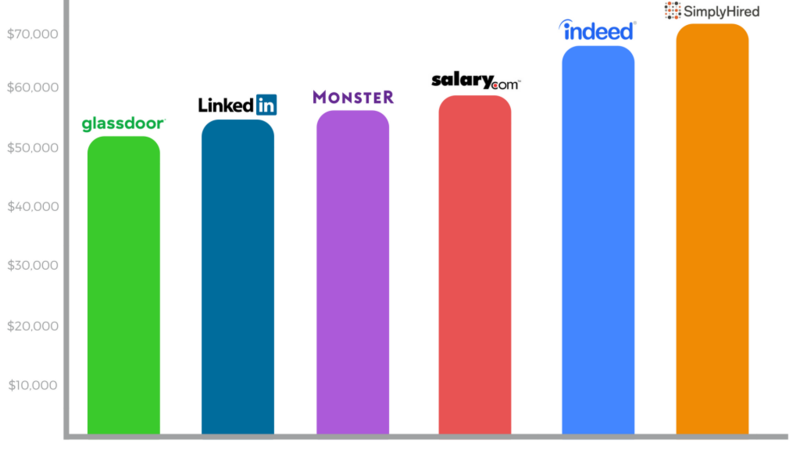 Out of all the salary comparisons, Salary.com surprised us the most. On the downside, we were surprised by the number of advertisements that clog up their pages. On the upside, one of the great features is that they allow you to compare up to three salaries. Which seems like a simple thing, but no other site that we reviewed offered this feature. To allow for a deeper analysis, they even dive deeper and give you an idea of what the value of the benefits comes to. 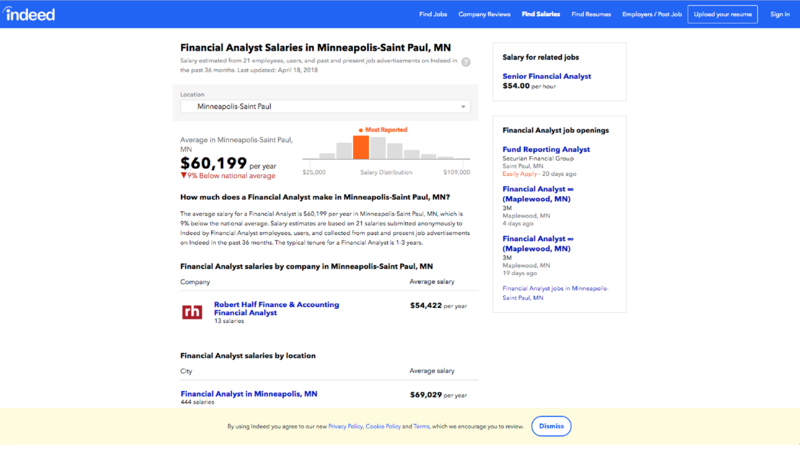 Unlike any other site, they offer a personalized salary report. It starts by submitting an extensive application about your past experience, education, performance, and current salary. …it will run you between $30-$80. As mentioned above, we set out to find out which salary estimator is the best for you to use. This involved analyzing everything from how intuitive it was to how accurate the data was going to be. As job seekers, we don’t want to settle for a job that isn’t paying us what we are worth. We want full transparency in the process. Especially as it relates to salary expectations. The salary estimator site that provided us with the most tools and information that we need to help us in our process…. After grooming through all the options, we felt that Glassdoor offered the greatest features with the fewest downsides. 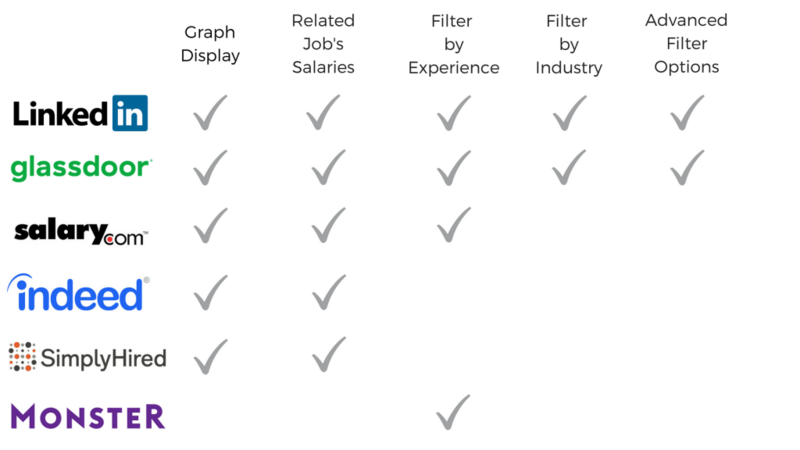 Compared to the other sites, Glassdoor had some of the strongest filtering power. Being able to filter not only by experience but also by size and industry. With these features, you are able to drill deeper and deeper into the accuracy of the actual number. One of the greatest wins for our sinner Glassdoor was the data. Compared to the other sites, they had significantly more data to pull from. The large foundation of data gave us more confidence that the salary information that Glassdoor was sharing was actually information we could defend during an interview. They also had the strongest filtering power. Being able to filter not only by experience but also by size and industry, allows you to drill deeper and deeper into the accuracy of the actual number. Although salary estimators are very useful in preparing for an interview or during a salary negotiation, there is more that goes into it. Salary is not just a number that you get, it is also a number that someone else has to pay. So, when you are preparing for that upcoming interview or negotiating your salary increase, remember it isn’t the salary but rather what you can produce that matters. will you get the salary that you deserve.